The Real Jenn C.: Jaws of Life versus Jaws of Death! Jaws of Life versus Jaws of Death! 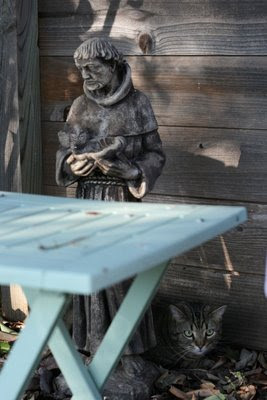 Awwww, isn't Sonic sweet the way he hunkers-down next to St. Francis (patron saint of God's critters) in our backyard? Looks can be deceiving! Earlier today, as I went out to the deck to herd Sonic inside, I saw a tiny green tail dangling from Sonic's lips. I had to pry his mouth open while giving him a very gentle squeeze to liberate a tiny baby chameleon lizard. The lizard dropped to the deck and sat in a daze for a few seconds while I hauled our fourteen-pound Sonic-kitty inside. I watched out the window as the baby lizard shook off her brush with death and skittered away. Sonic stood by the back door and howled for fifteen minutes, wanting to get back out for a rematch. That's not a fair fight, little dude, not at all. On a semi-related note, I've been tempted lately to give up on my vegetarian lifestyle and eat some meat. Almost every night the scent of grilled meat wafts over from some neighbor's house to my nose, causing visions of cheeseburgers to dance in my head. Last week, Chad was eating chicken tenders and I almost reached over to grab one. But today I saw a dead pigeon and suddenly meat is not at all appetizing anymore. Problem solved.